Bruce Gertz Quintet – OPEN MIND New Release! 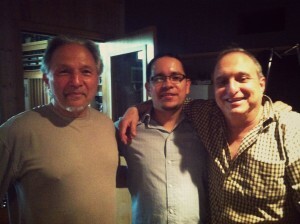 On late May I was part of a recording session for the new upcoming Bruce Gertz release late this year. The line up features Jerry Bergonzi, George Garzone – tenor saxophones, Bruce Gertz – bass, Luther Gray-drums, and Gabriel Guerrero-piano. This was a very fun session featuring music by Bruce, Jerry and George. Stay tuned for future release this year!